Not just any ol' sweater will do. You like fashion with flourish. 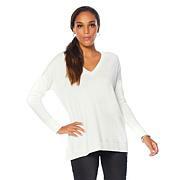 Look well-dressed even when dressed down in this cute ribbed sweater. 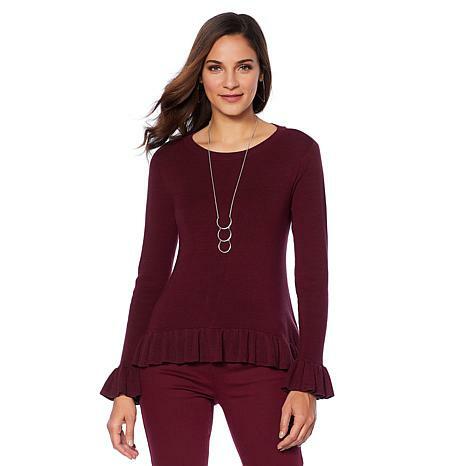 Ruffle cuffs and a hi-low ruffle sweep add the fun you're looking for in fashion. I really like the design of this sweater. Was on the fence on how it would look on me but is very flattering. Material is soft and a nice weight and lays beautifully. Highly recommend. You never know how something is going to look once you put it on, but there was no disappointment here. It fits beautifully, the material is high quality, the handiwork is perfect. What can I say, I bought another one in a different color, and considering a third. I really love my sweater, its comfortable, I look good in it Im curvy, so it adds to my curves in a good way, I got a Medium, in burgundy, I could have gone down to a small because its not tight, but it fits close, which means a small would still be a good fit for me. I like the quality, its been washed a few time I dry it flat its doing good for me so far, Thanks Diane, I will for sure get this in another color to add to my closet. LOVE THIS TOP. I BOUGHT IT IN BLACK, BUT AM CONSIDERING OTHER COLORS. IT IS GENEROUSLY SIZED. I ACTUALLY BELT IT IN, BUT I LIKE MY WAIST DEFINED. IT IS PERFECT WEIGHT FOR OUR SOMEWHAT COOL WEATHER. Very nice, Love the fit and fabric.